Week 1 (February 4-8): Pin it to Win it! Are you on Pinterest? Enter this week’s giveaway by pinning our website! Everyone who pins the page will be entered into this week’s shuffle to win a $25 gift card! Show us some love this week! To celebrate Valentine’s day, we want to see a photo that represents love! 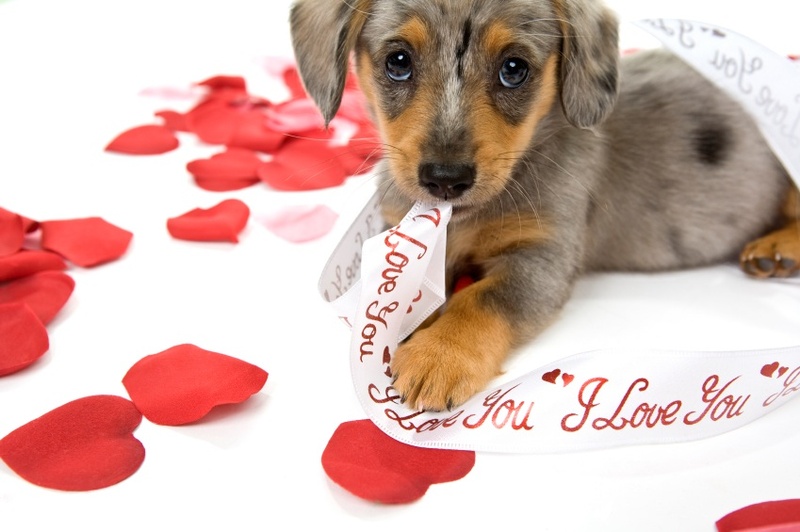 A few suggestions are: two pets together, you and your pet together, or your pet by itself next to some Valentine’s decorations or wearing red. Get creative! All entries (limit one per person) will be put into a random shuffle for a $25 gift card prize. Winner will be contacted on Friday, February 15th and honorable mentions will be posted on our blog. Come up with a clever, witty, or funny caption for the photo that we will post on February 18, 2013. The one that makes us laugh the most will win a $25 gift card. Winner will be chosen and announced on Friday, February 22, 2013. Every day, Trupanion celebrates the privilege of bringing our pets to work, but do you ever wonder what they would do if they actually had to work? Jasper the cat would be a masseuse because he loves to knead. Lazlo the dog would be a therapist because he’s a great listener. Ellie the dog would be a professional tennis player. My dog’s name is Ehno. Ehno means protector in Italian. His profession would be bodyguard.